Kampala — The daughter of foremost pan-Africanist and Ghana's first president Kwame Nkrumah, has arrived in Kampala for a high-level dialogue themed on positioning Africa for the 21st Century. 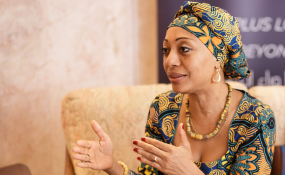 Ms Samia Yaba Nkrumah, who jetted in yesterday morning at the invitation of the Kampala-based Africa Strategic Leadership Centre, will be part of panelists to discuss the pivotal role of leadership towards the next Africa's development agenda. Ms Nkrumah is one of the founders of Africa must Unite, an organisation which aims to promote Kwame Nkrumah's vision and political culture. She was the first woman to head a major political party in Ghana, the Convention People's Party, founded by her late father and championed Ghana's attainment of independence in 1957. The dialogue, convened by the centre, opens today in Kampala and will be chaired by BBC World Service News Day presenter Allan Kasujja. Africa Peer Review Mechanism chief executive Prof Eddy Maloko will deliver the keynote address on tackling the big question of how Africa can uniquely position itself as the next global economic epicentre. Premier Ruhakana Ruhunda will grace the dialogue that will, on side lines, witness the launch of the centre whose board is headed by Dr Robert Mwesigwa, with members that include World Bank's director for fragility, conflict and violence Betty Bigombe, and former East African Legislative Assembly speaker Daniel Kidega, and Dr Korir Sing'Oei, an divisor of Kenya's Deputy President.